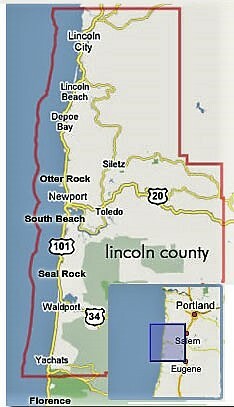 What is the Best Location in Oregon to see the central Oregon Coast? Seal Rocks RV Cove, of course! How far are the attractions? Everything from Florence to Lincoln City is within 30 to 45 minutes. Newport, which has the Oregon Coast Aquarium, Yaquina Head Lighthouse, Bayfront and Nye Beach restaurants and shopping is 10 miles north. Some of the best tide pools on the coast are located just across the highway. Beautiful sunsets can be seen from your site or within a short (2-5 minute) walk. Click images to visit websites. Walk the beaches. Build a sand castle. Fly a kite! Oregon State University's Hatfield Marine Science Center - go on a family quest! The Edge Art Gallery - blow a glass float! Browse the Port of Newport marina for the "boat of your dreams"
Log Cabin Museum containing Indian artifacts, pioneer farm equipment, logging and maritime exhibits at the Lincoln Historical Society, 545 SW 9th. View period furniture and clothing at the Burrows House next to the Log Cabin Museum. Enjoy a Sunday Brunch at one of the many local restaurants. Visit the Oregon Oyster Farms, 6878 Yaquina Bay Road. Buy some just-harvested oysters to cook at home. Visit our Elks and Eagles and Moose Lodges in Newport, Toledo, and Waldport. Yuzen - the best Japanese restaurant on the coast!